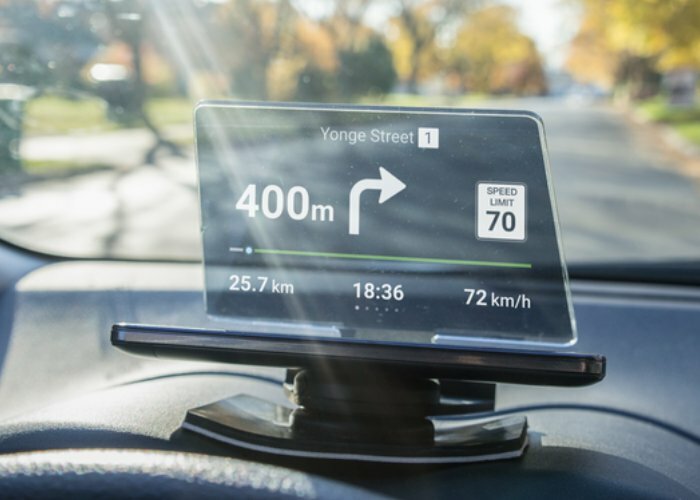 Hudify has this month launched a new Kickstarter campaign for its transparent GPS head-up-display that uses the power of your smart phone to create a portable display for your vehicle. Watch the video below to learn more about how the Hudify can provide you with all the GPS coordinates and more directly on your dashboard without restricting your view. Earlybird pledges are now available via Kickstarter from CAD $47. The creators of Hudify explain a little more about its inspiration, design and features. Conventional GPS systems take your eyes off the road, block your view, and often times it overloads you with unnecessary information. That’s why we’re bringing you Hudify, an automotive accessory that transforms the smartphone you already own into a transparent GPS system that keeps your eyes on the road. It helps you navigate, warns you of speed traps, red light cameras, or if you’re speeding. Technically, Hudify is an aftermarket head-up display (HUD). But no one really knows what a head-up display is – not unless you drive a recent high-end luxury car that has one built-in or fly commercial airplanes for a living. Head-up display technology is now increasingly being used to improve safety, comfort, and convenience in cars. For more information on the new Hudify jump over to the Kickstarter website for details by following the link below.